You are currently browsing Greta Bertram’s articles. The day has finally come when I have to say goodbye to MERL. 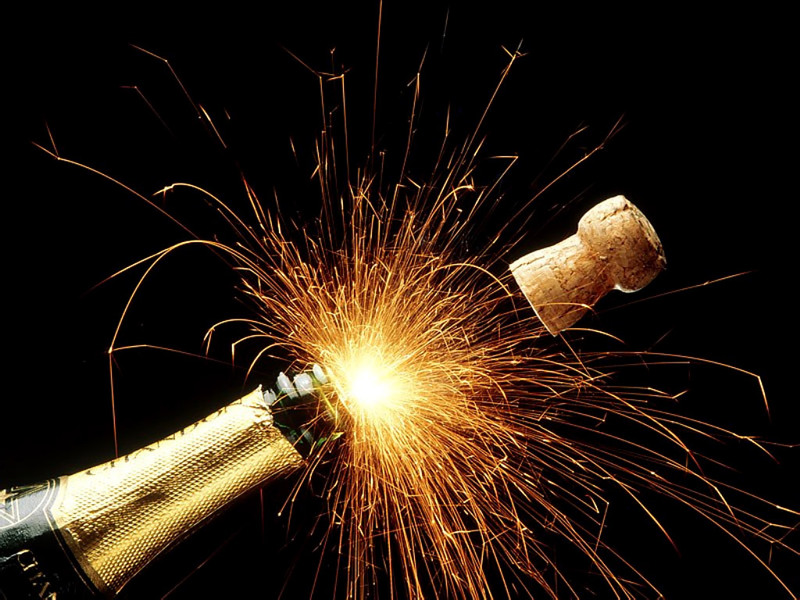 I’ve been here for nearly three years and have loved absolutely every minute of it – it really has been a dream job!!! And, in all honesty, I think I can say that there’s only been one day when I wasn’t looking forward to going in – which is pretty good going! MERL has been wonderful place to work (largely thanks to my amazing colleagues and volunteers, and the fantastic Felicity in particular) and I’ve loved all of the different things I’ve been involved in – the various projects, the events, meeting visiting researchers, and trying to convince everyone that baskets are the Best Thing Ever! The thought of leaving MERL and all my beloved craft collections (especially the baskets) is absolutely heart-breaking, but at the same time I’m really looking forward to my new adventures at the Polar Museum at the Scott Polar Research Institute in Cambridge. But my departure from MERL certainly isn’t an end to my love affair with craft – I’ll be carrying on as a trustee of the Heritage Crafts Association and will hopefully continue to try my hand at lots of crafts. As part of the Reading Engaged project, MERL is looking to develop a handling collection and programme of object handling sessions which can take place in a variety of settings: whether it be in-gallery, elsewhere on site, or off-site. We have been working with freelance curator and consultant Charlotte Dew to help us develop the collection, the sessions, and all the accompanying policies and procedures. 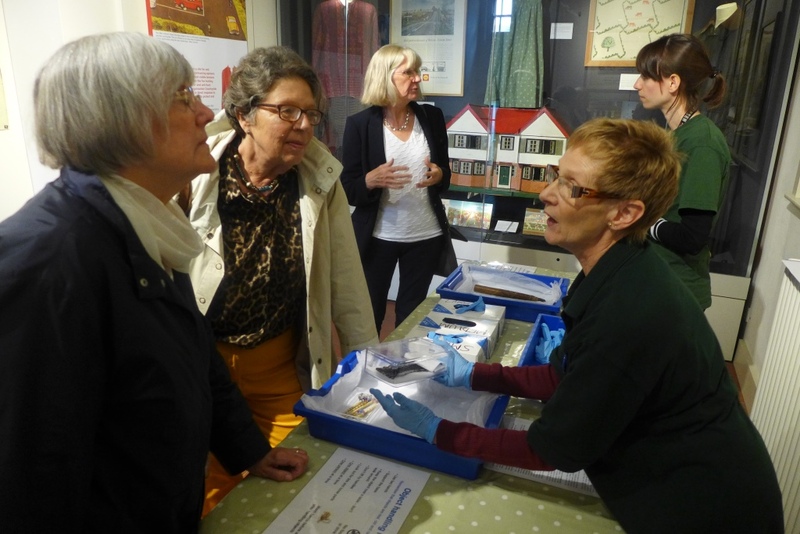 On Saturday we held an Information Day about Our Country Lives, MERL’s major redisplay (NB. The Museum will be closing to the public at the end of October for approximately one year, but the Library, Archives and Reading Room will remain open throughout. You can find out more about the redevelopment here) and took the opportunity to trial some of our ideas for a session based around looking at the relationship between craft tools and the finished items, i.e. how a tool is used to make something. Although we’ve been developing this session as a facilitated session for adult learners in the teaching space/studio area, we decided to test out some of the objects in an in-gallery setting. 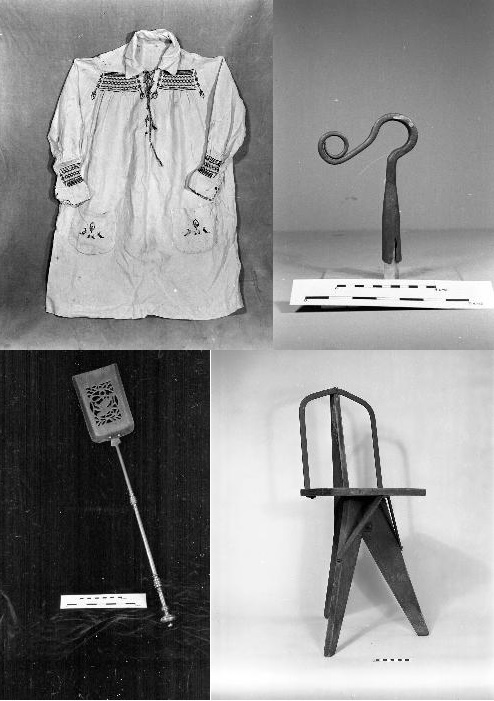 We had four objects available for handling: two relating to lace-making, and two relating to bodging. The lace-making pair consisted of four bone bobbins (MERL 55/205/1–4) and a piece of handmade lace (MERL 59/290/8), each in a small Perspex box. The bodging pair consisted of a chisel (MERL 51/112 – we didn’t want to shy away from trying out objects perceived as ‘dangerous’ or ‘high risk’) and a turned spindle from a Windsor chair (MERL 51/63). Nitrile gloves were provided for handling this latter pair of objects. We had a table set up in the Temporary Exhibition space, and each pair of objects was set out in a tray lined with acid-free tissue paper. We also had a copy of the ‘Object handling rules’ displayed by each tray, and boxes of nitrile gloves in small, medium and large were also set out on the table. There were two of us running the session, each taking charge of a pair of objects. I had prepared some background information for us both to look at in advance which detailed the purpose of the session, the objects we would be using, and some background information about the crafts and what sort of things we might want to discuss with visitors. —–Did they not realise they could? —–Was the need to wear gloves off-putting? —–Should we have had ‘Please touch’ signs? —–Was this because they were in Perspex boxes so gloves weren’t required? —–Was this because they were smaller so you needed to pick them up for a closer look? —–Was this because they were somehow ‘more interesting’ objects (they were certainly more colourful)? —–Was this because they were more easily identifiable objects? Perhaps we should have asked questions that necessitated touching – e.g. feel the weight of the tool, how does the tool sit in your hand etc. It would be great to hear your thoughts! What makes object handling appealing, and what makes it off-putting? What could we do to make it a better experience or a more successful session? Do you want to handle real museum objects? Earlier this week I spent four days in beautiful Sussex, three of them at the Weald & Downland Museum in Singleton. 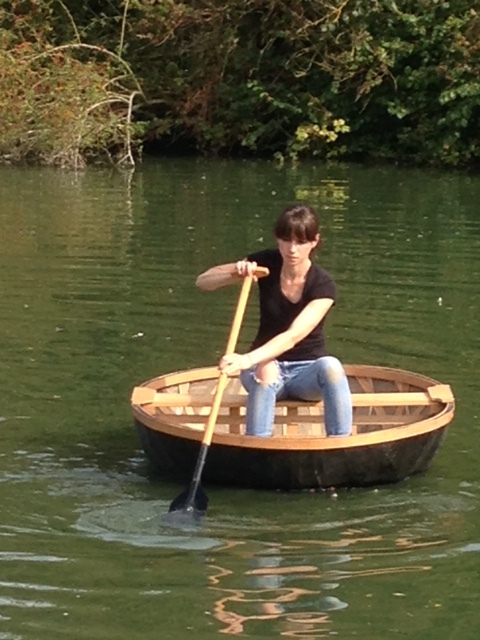 I’ve been wanting to make a coracle for years (no idea why!) 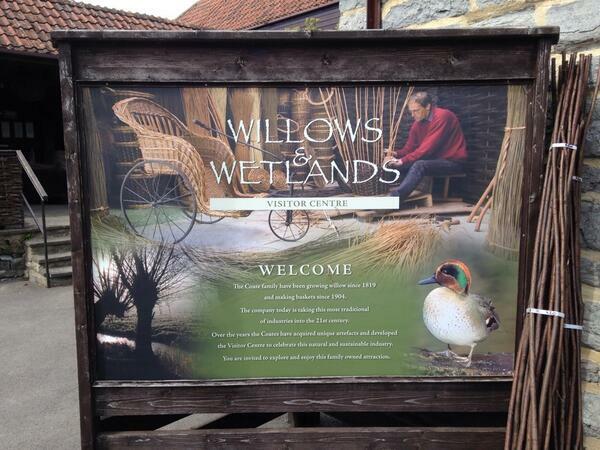 and finally got the chance this weekend at the Weald & Downland (a fantastic place for craft courses!). Coracles are found across the world and are often one-person vessels used for fishing. In Britain, the wooden framework of coracles would originally have been covered with animal skins, but are today covered with calico or canvas which is waterproofed with bitumen paint. The design of coracles varied across Britain; we have two in the MERL collection – one is made of ash laths woven together (MERL 56/187) and the other is made of a hazel and willow frame (MERL 60/535). Traditionally two coracles would work together when fishing, with the fisherman in each vessel steering with the paddle in one hand whilst holding onto the net stretched out between them with the other. Turns out there’s a coracle museum in Cenarth in Wales! 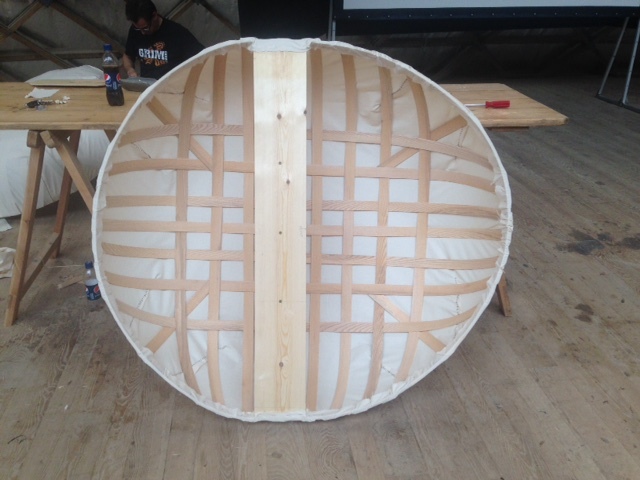 My coracle at the end of the course – it still needs waterproofing and a bit more woodwork and then we’re ready to paddle! The course was run by Kevin Grimley, with the help of his son Nathan, and was absolutely brilliant. The first day was spent constructing the wooden frame of our coracles (with the aid of some power tools). 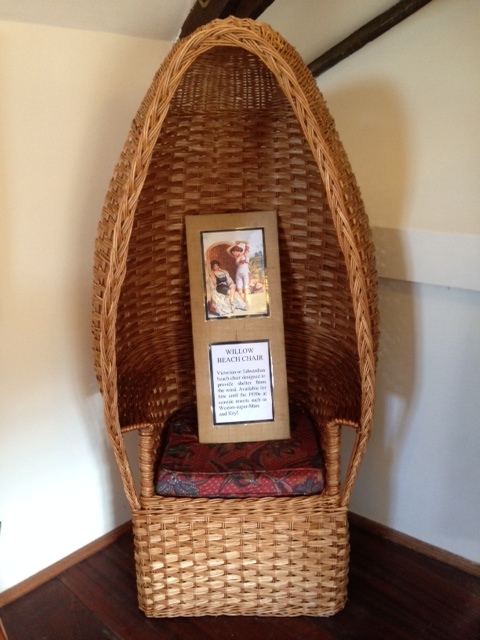 The frame is made of ash laths, constructed around the pine seat. I was a bit worried about lagging behind everyone else as it’s been years since I’ve done much woodwork, but my practice drilling, hammering and sawing a few weeks ago stood me in good stead! On the second day, we covered the frame in calico – pulling it taut and stapling it to the rim, and then stitching the seams. We need to finish our coracles off at home with a few layers of bitumen paint and then another lath around the inside and outside of the rim. Because ours wouldn’t be finished over the weekend, Kevin had brought along some completed coracles for us to have a go in on the Museum’s mill pond – it was great fun! The coracle felt quite stable, but the figure-of-eight paddling takes a little getting used to. Can’t wait to have a go in mine when it’s done! I was then back at the Weald & Downland on Tuesday for a conference on ‘The history of woodworking tools’, which was held in collaboration with the Tools and Trades History Society (TATHS) in celebration of the 50th anniversary of W. L. Goodman’s seminal book of that name. It was a great conference (although I didn’t quite fit the typical delegate demographic) and was divided into the sections of Goodman’s book – rules and measures, compasses and squares, boring tools (or ‘not so boring tools’), trestles and benches, saws, planes, edge tools, and chisels and gouges. I really liked the portable display cases that TATHS used. 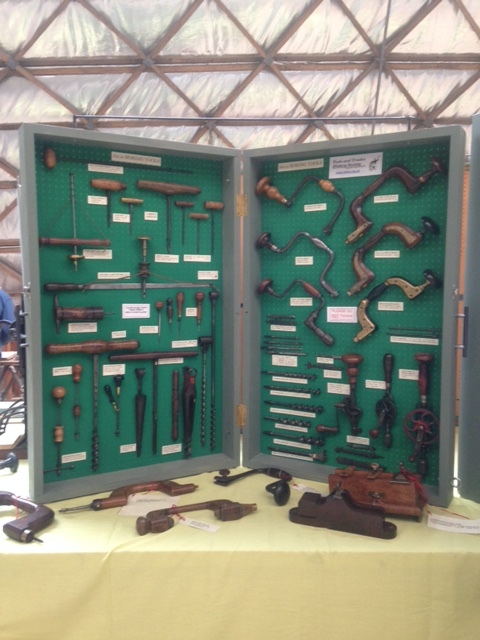 This display was entitled ‘Not so boring tools’! As ever, when I attend these kinds of things, I realise how little I knew when I did the A Sense of Place cataloguing and how many mistakes I must have made. My latest wish is to have the time to spend focusing on tool manufacturers – looking at the objects, noting down the manufacturer’s marks, cross-referencing them with the various permutations of manufacturer’s names over the years and trying to date them. Alas, I doubt I’ll ever have the time! The first speaker, Jane Rees, made a very good point – that a lot of the detailed research into the subject of the conference is done by dedicated and interested amateurs, rather than museum professionals or academics and I know why – we just never have the time (especially when working on a project basis!). Marshall Scheetz explaining the making of a cask. I just wanted to say an enormous thank you to Marshall Scheetz, historian and journeyman cooper at Colonial Williamsburg in Virginia, USA, for coming to MERL and giving us such a wonderful introduction to coopers and cooperage. We began the day with a visit to the Museum stores, where we looked at the various coopering objects in the collection, from an array of tools to various coopered items such as buckets, butter churns and measures. 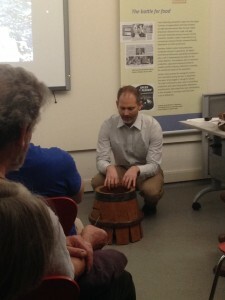 Marshall then gave a fascinating talk about his work at Colonial Williamsburg, the history of coopering, the process of making a barrel , and the different trades and industries that coopering has been associated with ­– including whaling, tobacco and gunpowder. The day ended with Marshall talking us through the coopering video on display in the galleries and pointing out the tools used in each process. The highlight for me was the way that Marshall used the part-made cask, truss hoops and cresset that we have at MERL to illustrate his talk – it really showed how you make a cask, the movements and actions involved etc. Colonial Williamsburg sounds like a truly amazing place, and I’m really grateful to Marshall for taking the time to visit us here in Reading and tell us more about it. It’s a ‘living history’ museum set in the time period of the 1770s, but what makes it so exciting for me is that the museum has twenty trade and craft workshops (e.g. basket-makers, coopers, dyers, wig-makers etc.) where the trades/crafts are practised as they were in the late-eighteenth century. Craftspeople undergo apprenticeships to learn their craft, and make items primarily for use within the historic areas of the museum. Most of the workshops have about four full time staff, who take turns talking to the public and carrying out their work. The drawback to this system, however, is that production rates are really low – in fact, just enough to keep the skills alive. Colonial Williamsburg is now firmly on my list of places to visit! We had a great turn out on the day, so thank you to everyone for coming. Image from the Farmers Weekly Collection at MERL. 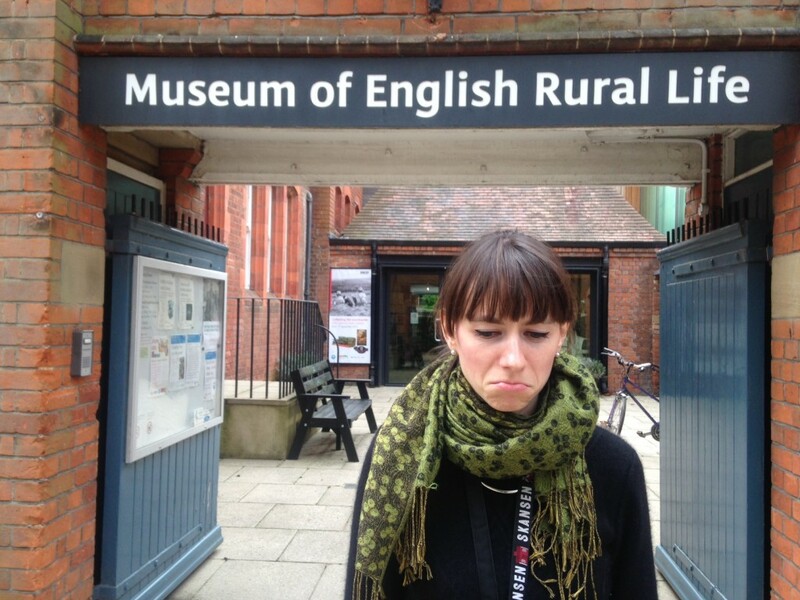 Since May I’ve been working on the Reading Engaged project to research content for the new galleries which will form part of MERL’s redevelopment project, Our Country Lives. True to my passions as ever, I’ve been taking the opportunity to focus on researching craft, as we’re hoping to dedicate a large part of one of the galleries to craft. We hope to use different crafts that we have examples of in our collections to highlight key issues affecting the heritage craft sector, bearing in mind that there is no one-size-fits-all story for craft. We also want to ensure that the galleries are up to date and reflect the current state of making and show the many varied and vibrant ways in which these crafts exist today. By the end of the nineteenth century, the majority of cooperages were found in breweries, when Britain was brewing approximately 37 million gallons of beer. In 1889, Bass’s Brewery at Burton on Trent employed 400 coopers; and circa 1900 Shooters, Chippingdale and Colliers employed 630 coopers! 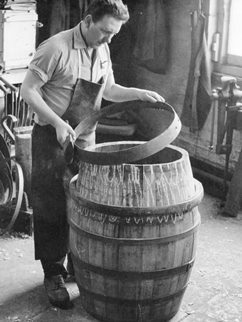 Until World War II, coopering had seemed a secure occupation but by the 1950s most of the independent cooperages in Britain had closed, and during the 1950s–1970s wooden casks were phased out of the larger breweries. By 2010 only 4 breweries still employed a qualified cooper, and today Theakston’s are the only brewery to do so. We have about 80 coopering tools at MERL, along with various coopered products including cider kegs, butter churns, cheese moulds and buckets. The majority of the tools come from two sets: one from the cooper’s shop at H. & G. Simonds Ltd., known as the Bridge Street Brewery, in Reading; the other from a cooper who served his apprenticeship at Reading Brewery 1948–1952 (we also have his certificate of indenture for his apprenticeship). The first set is currently on display in the Museum galleries. Take a look at the tools on our online database. I’ve been working to create a ‘content pack’ for each craft I research. This includes reading up on the subject and writing introductory notes, looking at the related objects we have in the collections and identifying particular objects which can be used to illustrate specific points and, with the help of Danni and Caroline, investigating the Archives to see what we have in terms of documents and photographs. I’ve also been in contact with Alistair Simms, England’s only Master Cooper (to become a Master Cooper you must have successfully trained an apprentice), who I’m hoping to visit in September, and Theakston’s Brewery. If you want to find out more about coopering, come along to MERL on Saturday 23 August when Marshall Scheetz, historian and Journeyman Cooper at Colonial Williamsburg in Virginia, USA, will be giving ‘An introduction to cooperage’. The talk is free. Details here. Our beautiful commissions in a mixture of plain and arty shots (thanks Adam!). Top L-R: Annemarie O’Sullivan, Bunty Ball, Sue Kirk. Bottom L-R: Maggie Smith, Karen Lawrence, the Mezzanine. On Saturday we welcomed 50 basketmakers to MERL for the Basketmakers’ Association (BA) annual Summer Meeting. For me, it was a very important day as it felt like the culmination of the work I’ve been doing with MERL’s basketry collections over the past 2.5 years, and it was great to have the chance to share our wonderful collection with the people to whom it means the most. The day consisted of a mixture of formal and informal sessions, with plenty of time for everyone to catch up with each other and share news. 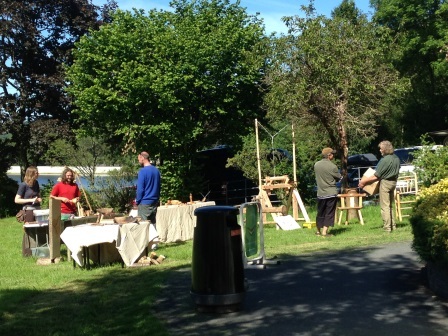 It was a gloriously sunny day, so we were able to make the most of the garden and had demonstrations in the sunshine from Rae Gillott making a willow waste paper basket, and Sheonagh Winterbourne doing rush chair seating. I gave a talk on the history of the basketry collection at MERL (including my recent discovery of the Dorothy Wright archive – although I think this was only news to me), and the work I’ve been doing with the collections through A Sense of Place and Stakeholders. Bunty Ball talked about the BA’s Traditional Basketry Project, which essentially aims to document every traditional basket in the country – an enormous undertaking! Contact the BA if you want to find out more or want to get involved. I also gave tours of the basketry collections in the stores. There was a selection of baskets out on the table for everyone to look at, along with accompanying documentation. 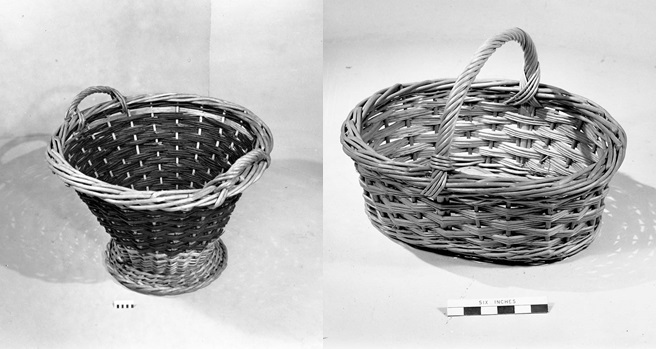 This included baskets that were studied during the Stakeholders project, examples of baskets in different materials (e.g. rush, straw and marram grass) and baskets that have received a lot of interest over the past couple of years (e.g. a Devon splint basket and the artillery shell basket). We had some original photos from the Rural Industries Bureau from the 1930s out on display, and also some basketmakers’ ‘Lists of Sizes and Prices’, including one which dates from 1850. There was also the chance to look at the rest of the baskets in the store. Everyone was so informative and I’ve now got pages of notes full of information to add the catalogue! The highlight of the day for me was, without a doubt, the arrival of some of the commissioned pieces from Stakeholders. They’re just absolutely wonderful and I’m so so so so thrilled with them! I’ll be blogging in more detail about each of them over the coming weeks, but here’s an overview. We received pottles from Annemarie O’Sullivan; a miniature version of Bunty Ball’s famous Sutton Hoo helmet; a panel entitled ‘Loosen the Corset’ from Karen Lawrence using white willow skeins woven using complex linking; a contemporary shopping style basket from Sue Kirk made using local (to Sue near Peterborough) willow and hazel, and inspired by the packing on some of our 1950s baskets; and a nest of three baskets made from every single part of the willow from roots to leaves and using 17 techniques, including some not normally associated with willow, from Maggie Smith. I love all of them, and can’t wait to get some proper photos of them! Unfortunately I didn’t get a chance to take any photos during the day as I was rushed off my feet, but the atmosphere was wonderful and I think everybody had a great time. The BA were as organised as ever, and came armed with books, noticeboards, information leaflets and (most importantly) cake! I’d like to say a huge thank you to the BA for choosing MERL as a venue, and to my colleague Phillippa for helping to organise the day and ensure it all ran smoothly. In what seems like an endless crisscrossing of the country, I spent Friday in Aberystwyth at a symposium about craft, heritage and woodland. The symposium was the culmination of ‘Harvesting the Knowledge’, a joint project between Ceredigion Museum, Tir Coed (a charity which works to improve the quality of life for rural communities in Wales) and the local community, and was funded by the Happy Museum. I was there to talk about the work MERL and the Heritage Crafts Association have been doing to support crafts – the former in relation to craft objects, and the latter in relation to craft skills. Like MERL, Ceredigion Museum has a large collection of objects relating to local craft and industry. And like MERL, Ceredigion Museum struggles to interpret the objects and to connect them to the processes by which they were made or used. One strand of ‘Harvesting the Knowledge’ has involved working with people with experience in greenwood crafts and woodland management to share knowledge about the craft objects in the collection. And one of the aims of the project is to promote social enterprise through traditional crafts, by creating a range of wood craft products which relate to the Museum’s collections to sell in the Museum shop (and hopefully helping to kick-start the participants’ self-employed careers). There were lots of examples of greenwood-work on display. The morning started with an introduction to the project from Alice Briggs, Assistant Curator at Ceredigion Museum. She explained the importance of marketing the new products in the right way, like emphasising that they were made by local craftspeople using local materials sourced from properly managed woodlands, and linking the products to the collections, the stories of the makers, and the tools used to make them. I think there is potential for a lot of ideas-sharing between Ceredigion and MERL in this respect, as I would like the MERL shop to feature more crafts and complement our collections. Hilary Jennings from the Happy Museum Commission who, as ‘Happiness Associate’ possibly has the best job title ever, briefly explained the idea behind the Happy Museum project. She was followed by Ffion Farnell, Director of Tir Coed – which sounds like a really inspirational organisation! They use woodlands as a resource for social, economic and environmental enrichment, and even offer apprenticeships and accreditation. We then heard from Bob Shaw, a long-term woodsman, and Stuart Evans, designer and technician at the Museum. Bob Shaw showed us how to ‘bodge’ a chair leg. 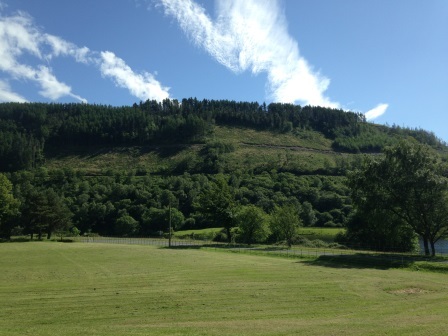 The symposium was held at the Cwm Rheidol Visitor Centre in a beautiful valley with stunning scenery – and there was even a steam train passing by. It was a gorgeous day, and thankfully we were able to spend quite a bit of time outdoors, enjoying the sunshine and the woods. 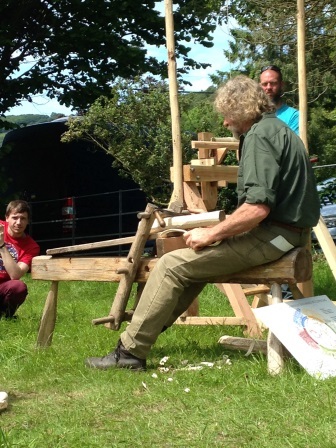 Bob talked us through the craft of bodging and gave us a demonstration of making a chair leg – from cleaving a log with a froe, to trimming with a side axe, rough shaping with a drawknife on a shave horse, and final shaping using gouges and chisels on a pole lathe. And in the afternoon, Phil Morgan of Sustainable Forest Management gave us a tour around the Cwm Rheidol woods and explained the work he has been doing to manage the woods in a sustainable way, working on the principle of ‘continuous cover’ (where you only fell selected trees within an area, rather than clear-felling an area). 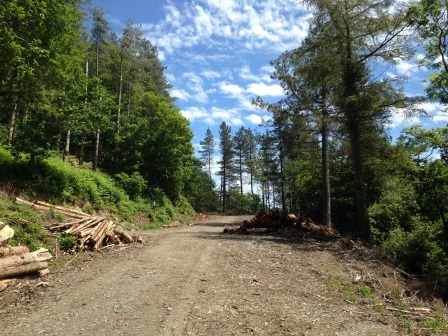 Phil Morgan of Sustainable Forest Management gave us a tour of the woods and explained how he was managing these woods. I’m keen to see what types of products are made and how they’re marketed, as I think there’s a lot that MERL can learn from this aspect of the project. But ‘Harvesting the Knowledge’ more generally really appeals to me – particularly as it gives the Museum a role in supporting craft skills and craft careers, and also traditional woodland management practices and careers. So I’m really keen to see what comes of it! It’s taken 2 years and 4 months, but we have finally finished scanning all of the black and white 60-series negatives of objects in the collection. I say ‘we’, but Felicity and I probably only did about 5% of the scanning – the other 95% was done by a brilliant and extremely dedicated team of volunteers. In total, we’ve worked our way through 23 boxes of negatives to do a whopping 10265 scans! The project started back in February 2012 as a short project funded by JISC (Joint Information Systems Committee), with the aim of digitising 3500 negatives. Working on the principle that a black and white image is infinitely better than no image, we rapidly realised that this was a brilliant way of adding images to the catalogue (as taking new photographs is very time-consuming and expensive). So we decided to just carry on, with the aid of our volunteers, until we’d done all of the negatives of objects. Not only have we finished all of the scanning, we have also added all of these negatives to Adlib, our catalogue, and they are all available to view online (either through Adlib or Enterprise). This is thanks to one tireless volunteer, Carl, who has spent week after week after tedious week copying and pasting links. This project has made a huge difference to the percentage of our object records which now have an image attached. So I’d like to say an enormous thank you to Alex, Anna, Anne, Anne, Becca, Beth, Carl, Charlotte, Christina, David, Diana, Doug, Emily, Emma, George, Josh, Juliet, Megan, Nina, Pablo, Phoebe, Rebecca, Steve, Stuart and Tom. THANK YOU!!!!! It’s been a long time coming but last week I finally finished re-classifying all 18900 records in the objects database on Adlib as part of Countryside 21!!! I’ve been working on this on and off since mid-December so it’s great to have finally completed it – especially as actually completing anything is somewhat of a rarity of at MERL. The project target was to re-classify and add associated keywords to 10,000 records. However, it seemed to me that the process would only be worth it if all the records were re-classified – so that’s what I did! The actual process of applying the revised Classification to the object collections has revealed some flaws in the new Classification. For example, there is nowhere to put objects which relate to agriculture generally rather than specifically to Cultivating (3.00) or Harvesting (9.00) – this was also true of the old Classification. Lighting that isn’t for domestic purposes is now a bit of a problem – previously lighting was a primary heading of its own, but it now falls under the primary heading Domestic and family life (4.00). However, these are all things that can be reviewed in due course. My application of the Classification and keywords may not be perfect but it’s about 95% consistent and logical – which should make an enormous difference to anyone searching the collection. The revised Classification and other associated activity keywords have been published on the MERL website and are available here.